Yeah...Yeah...I have been teasing you all on Facebook for the last month. I posted something about having a cool new toy, but could not talk about it. But now I can! Just now in New York (hence the real reason I am here in NYC), DJI announced the new Phantom 3 Advanced (HD) and Phantom 3 Professional (4K) aerial cameras. I have had a pre-release version of the Phantom 3 Advanced (HD) for the last month and have had a blast with this new aerial camera (or what some people call "drone"). DJI got me the new toy and asked me to go out and capture some cool stills and video for their product launch. The good news is that it looks fairly similar to the Phantom 2 (P2), so whenever I would fly this in public and people would ask if it was a Phantom 2, I would just say "yes". But in truth, this new Phantom 3 Advanced HD (P3 HD) is really a vastly improved product from it's predecessor. 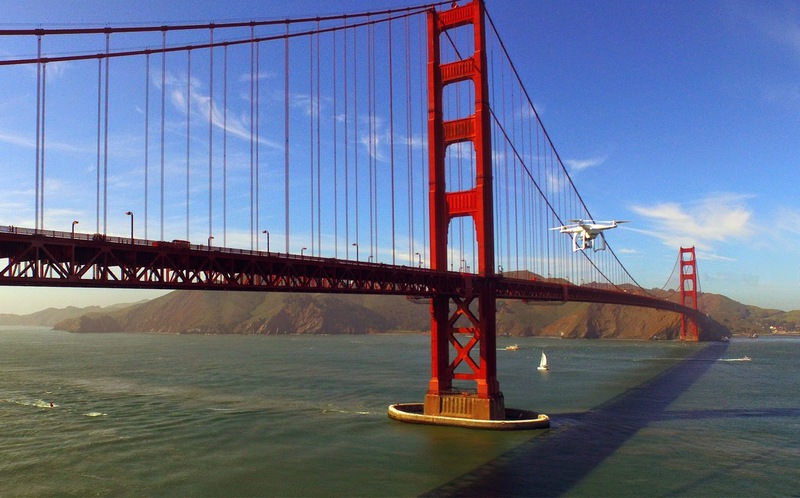 Here is a photo of my Phantom 3 HD by the Golden Gate Bridge. This was taken using a DJI Inspire flying behind me. The new HD camera is the most important feature for me. Take a look at any of the videos or stills which I captured with the P3 HD and you will see what I am talking about. And with the new DJI Pilot software installed on my iPad or iPhone (they have the software for Android too), I have a ton of control over the camera. I am able to control all aspects of the camera including, choosing between 4x3 and 2x3 aspect ratio, exposure comp, JPG and or RAW, auto or manual modes, burst mode shooting, and so much more. One of the things that drove me crazy with the P2 was the stair stepping of the exposure in video mode. When I flew over Niagara Falls, and moved from the darker river to the white water falls, you can see the exposure changing in obvious steps. The new camera on the P3 seems to have fixed that issue. Thank goodness! Unlike the P2, I learned that I can fine tune the camera to be perfectly straight on the horizon, which I learned about after capturing the first couple of videos you will see here. The controller that comes with the P3 HD is excellent. It is very similar to the controller which comes with DJI's higher-end Inspire model. Not only are the controls responsive and easy to figure out, but there are now added buttons and wheels (compared to the controller on the P2) for much easier panning and tilting of the camera and overall flying. DJI has added a button on the left of the controller to start and stop the video mode and a shutter button on the right side of the controller to take photos. This lets me shoot images and video without having to take my hands off the remote. I really like that. I also like that the new controller can accommodate something as small as my iPhone and as large as my full sized iPad Air. It is really cool to fly the P3 HD when looking at a large display. The new controller has a built in battery which can be recharged. And from my month of experience, this battery lasts a very long time. Both the Phantom's battery and the controller can be charged at the same time with the included A/C charger. 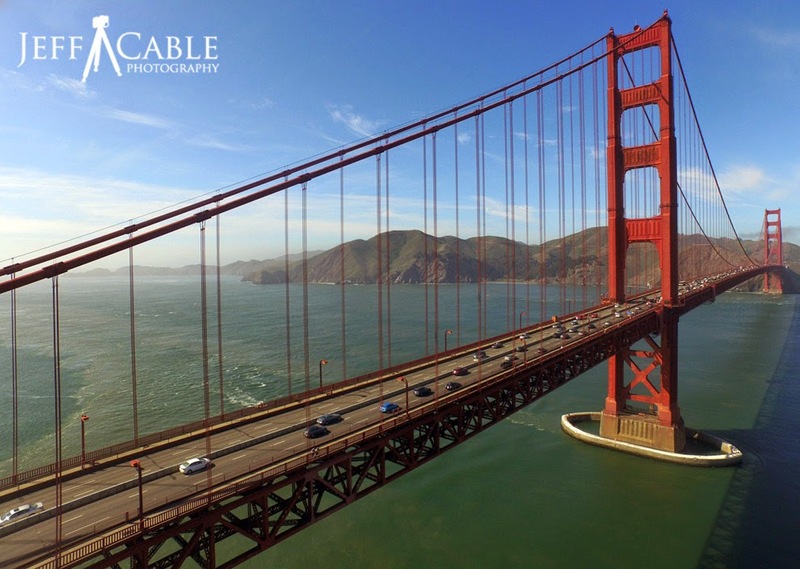 Check out this first video flying over the coastline of San Francisco with the new Phantom 3 Advanced (HD). I have added embedded text to explain some of the new features, and my thought process in testing the new device. The size of the P3 is similar to that of the P2. Enough so that the P3 will fit into my hard travel case which I was previously using for the P2. The batteries look exactly the same as those used in the P2, but they are not interchangeable. I am hoping that with the final shipping models, there will be something that differentiates the two. This can be a bit confusing to someone who might own both models. The good news is that the P3 battery will give you a full 20 minutes of flying time. This was critical for me since I was only given one battery for the month. 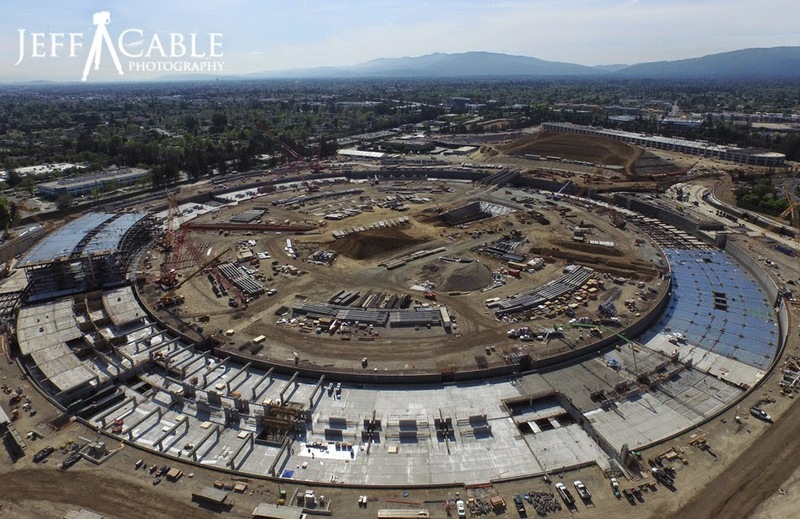 Here is a video flying over the new massive Apple Campus that is being built in Cupertino, CA. This is located only 10 minutes from where I live, but until now I had not seen what was going on behind the big green walls. This is the best thing about flying these cameras. I can capture stills and videos not possible to photograph any other way! I had a ton of fun with the Phantom 2, but this new model takes that up a level. With the new sharper videos and stills I am once again looking for places to fly over. This third video is really cool. 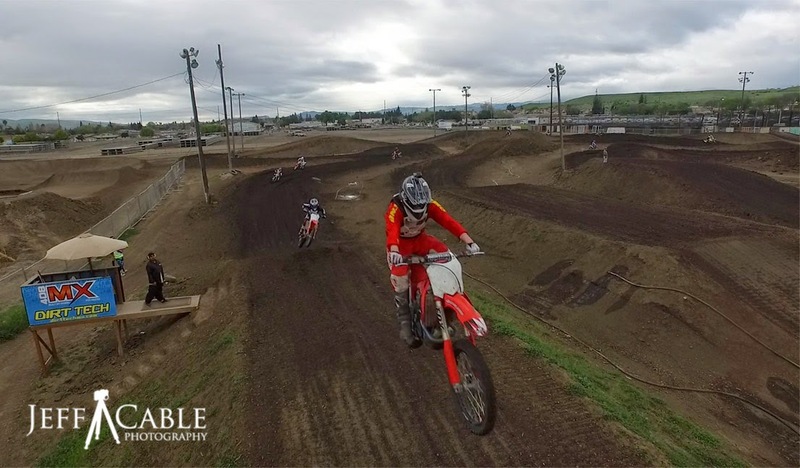 I took the Phantom 3 over a local motocross track. This last video shows some footage from the Phantom flying over some surfers in Santa Cruz, CA. I wish I had more than one battery with me for this. I was just getting good at tracking these guys when I ran low on battery power and had to bring the P3 back to me. 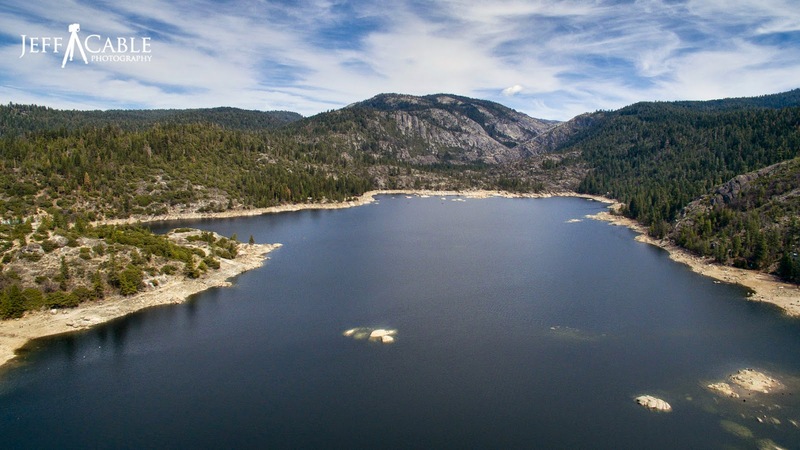 This last still photo was taken from high above Pinecrest Lake near Yosemite. As you can see from the photo, the camera does a very nice job of capturing the details in the mountains and sky. I did darken the sky in Photoshop, but all the detail was there to work with. I did not know the pricing information for the new Phantoms until I was just sitting in the launch event. Holy cow! DJI got REALLY aggressive with the pricing. 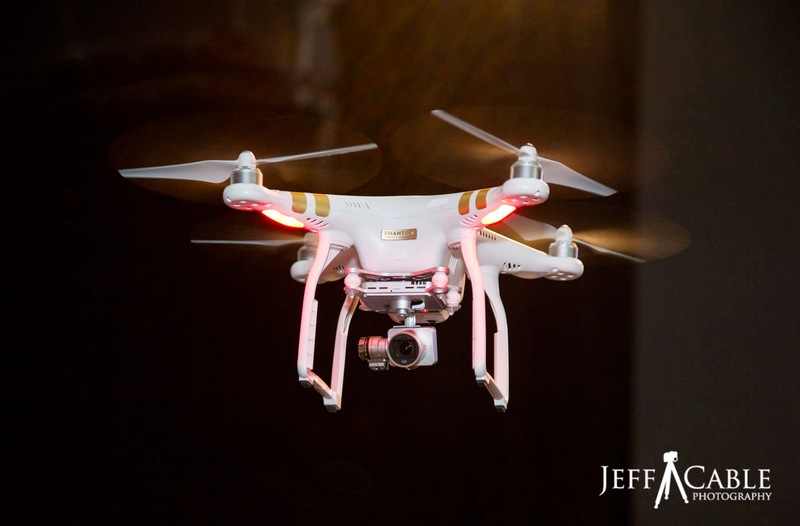 The Phantom 3 Professional is only $1259 and the Phantom 3 Advanced is only $999. That is amazing! I think that DJI has done a great job of delivering the next generation of aerial camera, and raising the bar to stay ahead of their competition. And now it is up to all of us to use this new technology and deliver cool new videos and photos to the masses. I am ready! I want to get ahold of the Phantom 3 Professional ASAP! 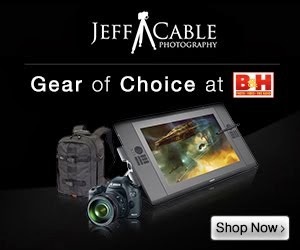 If you are interested in getting a Phantom 3 or purchasing any camera equipment, please click here to go to B&H Photo, as I get a referral from them if you enter this way. I would really appreciate that. Thanks, Jeff. Will these things be all over the Olympics next year?? Great review Jeff. It's really appreciated. Hi, may I know , is there any different between p3 pro and advance of both the photo quality ? Awesome shots as always! I agree that the Phantom 3 series has greatly advanced from that of their predecessors. The pricing has stayed low as well, allowing for even beginner enthusiasts to take some amazing photography. It's awesome to see the evolution of drones! Why do I teach photography online for free?